National Infrastructure Minister Uzi Landau said Thursday that Israel is willing to use force in order to protect the natural gas reserves discovered off its northern shores. During an interview with the Bloomberg news agency the minister responded to Lebanon's claims that some of the Leviathan and Tamar oil sites, estimated to be worth some $40 billion, are within its territorial waters. "We will not hesitate to use our force and strength to protect not only the rule of law but the international maritime law," Landau said. "Whatever we find, they will have something to say. That’s because they’re not challenging our findings and so-called occupation of the sea. Our very existence here is a matter of occupation for them. These areas are within the economic waters of Israel." Earlier this month, Lebanon's Parliament Speaker Nabih Berri claimed that Israel was ignoring the fact that according to the map the reserves are partly within Lebanon's territorial waters. Last week, Lebanese Energy Minister Gebran Basil said that his country will not allow Israel "or any company serving Israeli interests to drill gas that is in our territory." He noted that Beirut has warned the American Noble Energy company, which is involved in the drills, not to come near its territory. The Israeli companies involved in the drills, on their part, stressed there was no basis for Lebanon's claims. A statement issued by Avner and Delek drilling companies noted that the issue had been carefully examined and that all of the pertinent drilling areas are within Israel's jurisdiction. It should be noted that a large part of the area containing the gas reserves is within Cyprus's territorial waters. Landau noted that a previous disagreement between Israel and Cyprus regarding the location of their joint naval border had already been settled. 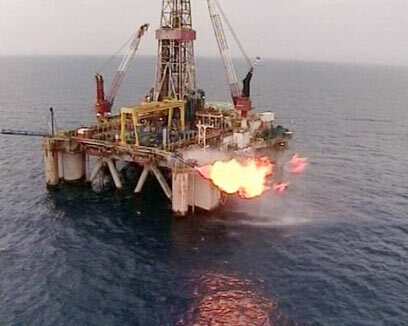 Cyprus has also issued its own tender for oil drills and the Israeli-American partnership responsible for the Israeli drills won 30% of the license. It is slated to begin drilling gas in Cyprus within the coming years in exchange for future royalties. No such arrangements, however, can be reached with Lebanon, as Israel does not maintain diplomatic relations with it. Therefore, there is no agreed-upon joint naval border between the two countries. Moreover, Israeli and Lebanese maps of the Mediterranean Sea are not coordinated. For example, Lebanese maps indicate Israel's northern border stretches west of Rosh HaNikra grottoes whereas Israeli maps mark it west of Metula. See all talkbacks "Landau: Israel willing to use force to protect gas finds "